Last weekend my dad treated us to a fishing trip. When my brother and I were little and we had a little free time, we would head down to Galveston, TX every weekend we could and wade in the waters of Galveston Bay and fish until we ran out of shrimp, while munching on cold fried chicken to keep us going. We'd even charter a boat maybe once a year. This trip was a little bit more sophisticated than the trips of our youth. We made the trip over south Louisiana to the town of Hackberry, which sits right on Lake Calcasieu. Hackberry Rod and Gun gets you setup and treats you right. Dinner is at 7:00 and the wake up call is at 4:30. Coffee and breakfast are ready and waiting for you. In the morning we met our guide and loaded up the boat. Our guide, Jimmy, took us out first to catch our bait. 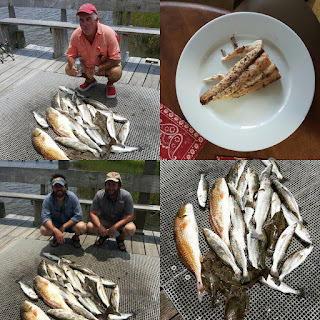 Armed with mullet and pogey, we spent the day chasing red fish and speckled trout. We caught a few flounder too. We didn't catch our limit, but we were happy with the 27 fish we caught. Jimmy filleted our fish for us, washed it and bagged it. The red fish was filleted with the skin and scales left on, called on the half shell, which is the traditional way. Back at home, I put the red fish on the grill with simple seasoning of black pepper and salt. With the scales on, you leave the fish on the grill scales side down and cook until done without flipping. We made fish tacos and used the rest of the fish for some seafood chowder with some shrimp.